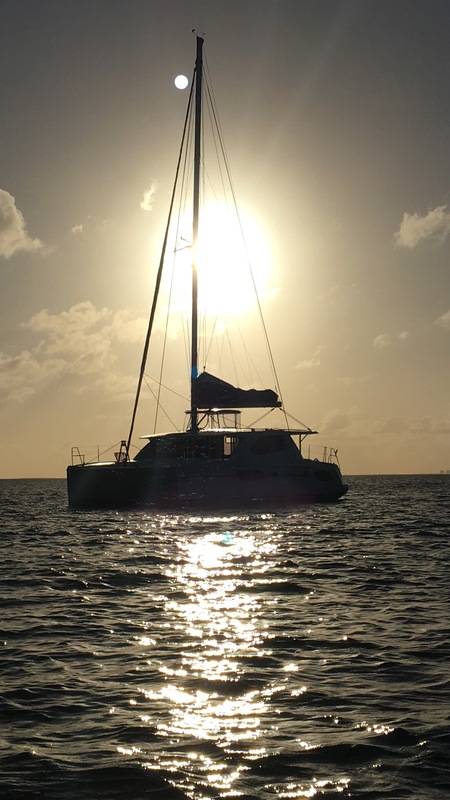 As we headed north from Georgetown along the Exumas, we thought it would be wise to take advantage of the fuel facilities at Emerald Bay Marina. We planned our arrival for a day when the surge would be minimal since the channel entrance can get really “sporty” with swell along the eastern coastline. Our boat has two 90 gallon fuel tanks for our two 39 hp Yanmar engines (and generator), and since they’re diesel, they rarely need re-filling. We likely use about a gallon an hour as we tend to motor slowly and don’t use the generator that much. 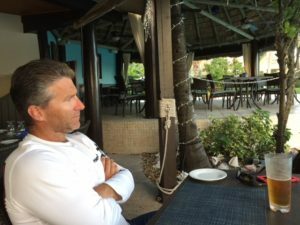 As we prepared to enter, John & I went over our approach plan – he was at the helm and I was to prepare the fenders and dock lines once were in the channel. As we entered the mouth of the channel, one large wave passed ahead of us just to make sure we were paying attention, but we really didn’t get affected by any surge. I readied the fenders, tying each to stanchions and getting ready with a roving fender just in case. We approached the dock and John turned the boat 180 degrees as we planned, placing the helm closest to the dock for better visibility while I put the fenders over the side. We saw a dock attendant waiting to take our lines. I said some very bad words that I won’t repeat here, as I quickly realized that one of the fenders I put over the side had a spare line that was now firmly wrapped around the propeller! “Fouling the prop” is a fairly common problem, and one I hope never to encounter again. 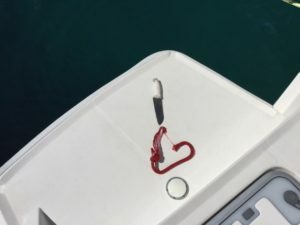 It can happen when you encounter fishing lines or lobster traps, or other lines that make their way into the water and find themselves wound tightly around the propeller. With only one engine, John maneuvered the boat alongside the dock while I continued to swear and fume about the situation I just put us in. We got fuel and then moved forward on the dock to allow 2 other waiting boats to tie-up so they could fuel. The dock attendant said it isn’t normally busy at all, but we had added a lot of excitement to his day. Frankly, I would have been happy with boring. John tried to start the fouled engine, putting it in reverse and forward, hoping to free the taught line…but no luck. It was tightly wrapped. 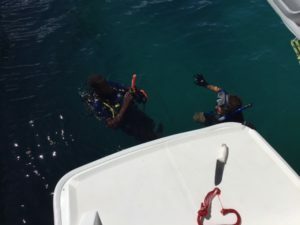 He got geared up in his wet suit and hopped-in to take a look. 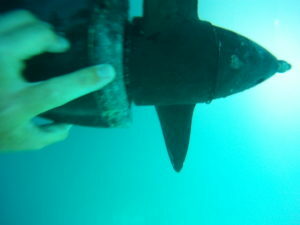 The spare fender line had wrapped around the propeller just between the zinc anodes and the shaft, and wouldn’t budge, even when he pulled on it with significant force while holding his breath underwater. We needed someone with dive gear who could stay underwater to free the line. 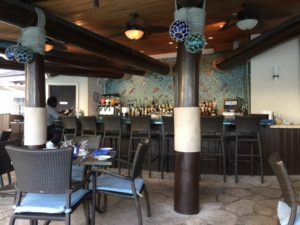 The dock hand knew someone on the Sandals Resort dive boat which had just returned. He arrived about 30 mins later and although he was fairly young, assured us he had rescued many fouled props. The diver and John got in and using a huge carving knife, he quickly freed one piece of the line. The remaining line however was still firmly wrapped behind the zincs and required some tools to remove them, which then allowed the line to be freed. After about 20 mins, the line was free and the zincs were replaced. Now we just needed start the engine to make sure it was working fine. And we also needed to move away from the busy fuel dock. The moment of truth…John hit the ignition and started the engine. He slowly moved the lever forward and reverse while still tied to the dock. There were no funny noises and all seemed to be OK. Awesome! We decided to stay the night and consult with a few folks over the phone to ensure we considered all that we needed to before heading out to our next destination. Once we were securely positioned at our dock slip, John tried the engine in forward and reverse and seemed to have good thrust. He compared the prop’s movement with that of the other saildrive, and they were the same. I checked the saildrive and engine oils and both appeared fine, showing normal colour and levels. I needed to do this as there are 2 seals in the sail drive lower leg, one to keep the sea water out, and one to keep the oil in. If the oil level rose, or was getting milky, or there are metal filings, you have an issue. We seemed to have dodged a huge bullet! This is what the bottom of the saildrive looks like without a rope wrapped around it. John’d finger is pointing to the zinc anodes the rope got caught underneath. 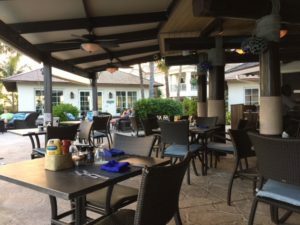 We decided to check out the nearby Grand Isles Resort for a late lunch at their poolside restaurant Palapa Grill and relax after a painful day. As we contemplated the day’s events over the infinity pool, we were very happy to be able to just stay at the marina and not have to rush off to another destination. 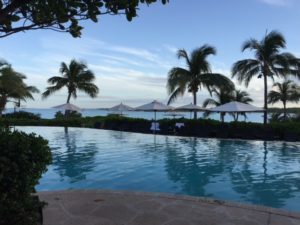 It was lovely to just enjoy the gorgeous views as we looked out over the infinity pool to the surrounding bay…and remember how fortunate we (still) are. Wow, I guess “situations” happen on the water. Sounds like you guys handled it like pros. Well done! Glad everyone is safe and no equipment damaged. One of those hard learned lessons. Read your update twice. Happy problem is solved and no damage.